The economic landscape and drivers for growth in deep sea mining. Understand the key market drivers and growth prospects for the near term. Where are the opportunities? Achieving sustainable seabed mining projects in harmony with nature. Hear from frontline deep sea ecological experts on the latest techniques to build an environmental impact assessment plan. The status of prospecting and exploration, the latest methods and results. Explore new areas of economic value and be the first to hear about the latest methods and results from prospecting and exploration activities. Regional opportunities to harvest seafloor massive sulphides and manganese nodules. Discover the hottest regional opportunities to harvest seafloor massive sulphides and manganese nodules from geological experts. Working with nations through a regulatory framework, the opportunities and risks. Hear from key regulators and develop a cohesive plan to work with the International Seabed Authority and individual nations through the regulatory challenges. Technological developments associated with commercialising deep sea mining. 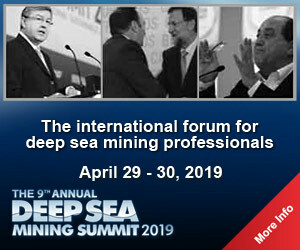 Be at the cutting edge of technological developments for deep sea mining and explore diversification opportunities for existing companies involved in offshore applications.